+1 Entrepreneur Interviews celebrate Fort Wayne area entrepreneurs who deserve an upvote. This post celebrates Collective State, a welcoming and inviting center for the arts located in Fort Wayne’s East State Village. What do you do when you are in the middle of raising a family, are in your tenth year working a secure good job with a great company, but just aren’t excited about or fulfilled by what you are doing? If you are Jon Brown, you take some time to reboot. As Jon says, “I needed something different. There are things I believe in and am passionate about that I want to bring to the community and to my family.” Jon left Steel Dynamics and worked with Bravas for a summer while thinking through next steps. Jon had long been a patron of the local arts, particularly music and visual art. He had seen other cities develop a wider, more sustainable arts market for their local artists. They had more and better access to venues, places to exhibit or perform. Most importantly, they had more engagement with not just fellow creatives but with supportive patrons. A sustainable local arts market doesn’t just benefit the artists. It is “massively important”, emphasizes Jon, for patrons to add beauty to their lives and make adding beauty a priority. 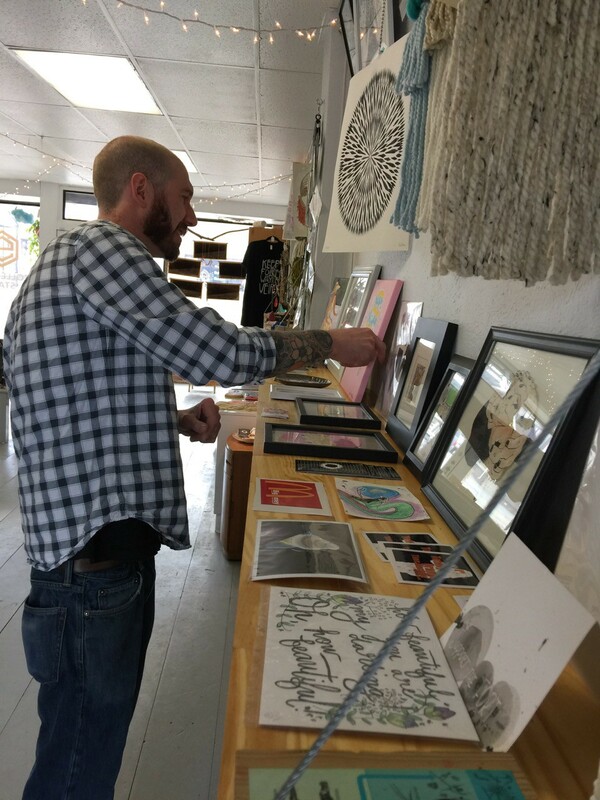 Jon fully believed that in Fort Wayne patrons would be supportive of local art if they knew the art existed and saw or heard it. For that to happen, he thought, our community needs more “welcoming storefronts” — inviting and accessible for patrons. Sounds a bit like a entrepreneurial vision, doesn’t it? It was no mystery why accessibility was on Jon’s mind. Let’s back up a bit to the Spring of 2016. Jon and his wife, Lissa (a wonderful and prolific ecofeminist artist) had a challenge. Lissa, like many of our local artists, had amassed stacks of paintings. “How do we make something positive out of this — make it more accessible?” was the challenge on their minds. The experiment they decided to try was called the Fort Wayne Free Art Collective. Ask our local artists to package a piece of art to protect it from the elements, blue-tape it to a building somewhere in the city, post a photo of that to social media (with just enough of a clue that someone can find it), let anyone who finds it take it home (for free) to own it and learn about the artist. It worked amazingly well. Various artists contributed works. Art lovers watched the FWFAC social media accounts (nearly 1,300 people follow the Facebook account), waited excitedly for the next blue-tape post, and raced to see who could get there first. The FWFAC branched into other public art. Ryan Krueckeberg joined and helped fund raise for larger scale public art projects, like the Jerrod Tobias mural on the Brass Rail. Public art solves the problem of accessibility. Anyone can see it— you just walk there. For Jon, Lissa, and Fort Wayne “Accessibility” achievement unlocked! 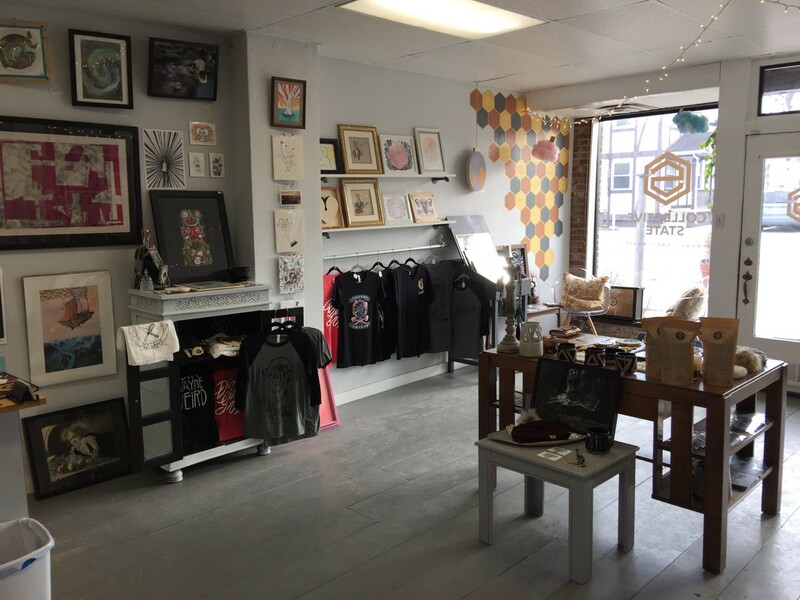 Collective State defines “art” very broadly, very inclusively: visual, music, ceramics, weaving, leather, apparel, metal, glass, jewelry, and much more. Think of a genre or medium and ask if they’ll support it, and I’ll bet you ten bucks — no, make it twenty — the answer will be “yes” (assuming the source is local, that is). Jon describes the layout as “dense”. Over 50 local artists and local bands have contributed so far (and that’s probably going to be a super low number by the time this article is published). Jon seeded Collective State’s merchandise by starting with the artists he knew, and then other artists started reaching out to him. As an already well-connected person in the local arts community, Jon was quite pleased to discover and meet many artists he didn’t already know! He is genuinely happy to provide an outlet for artists to display and sell their work. Jon has created an environment where all visitors can feel welcome, and not feel intimidated by a negative “OMG, we’re so exclusive” vibe, but rather can feel the positive energy and neighborhood community vibe of a very inclusive arts space. He knows each and every artist on display. He’s curated the works to include those that make sense and are not over the top. He can tell the stories of each and every artist — and many of the individual pieces on display. 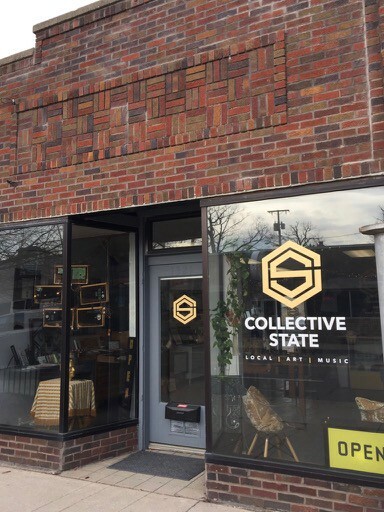 Collective State is, as Jon says, “Not just a store.” It is a place where people meet. The space might be small (just 800 square feet), but that doesn’t stop Jon from holding frequent events. Musicians, comedians, artist installations, artist workshops, etc. Visualize the space below filled up with an art installation from someone like Leigha VandeZande in the window on the non-pictured side of the door, a musician like Sankofa or Jared Andrews performing in the other window, food from someone like Big Apple Pizza, drinks from someone like CS3 or HT2, and (of course) a standing room only crowd of happy people of all ages [Collective State is a family friendly venue]. Toward the back of the store, beyond the logo wall and by the back door, you will find an alcove devoted to local bands. 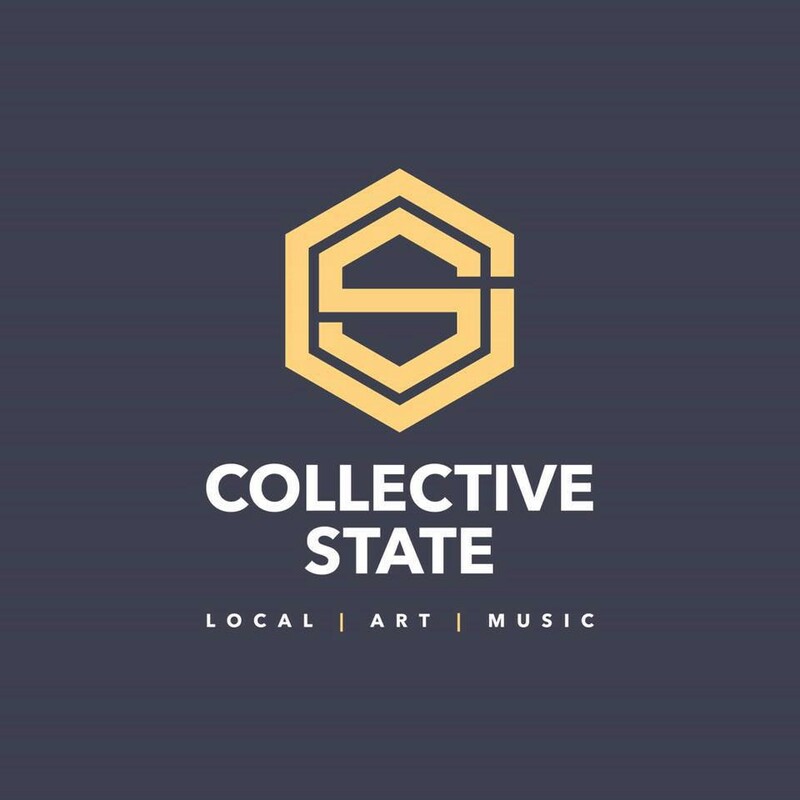 I agree with Jon when he says, “For the size of our city, our local music is crazy good!” Collective State stocks their CDs, their t-shirts, their posters, their stickers, and any other merch. It’s a place to get to know local bands, especially if you are under 21 (i.e. not eligible to hang out at the Brass Rail). It probably goes without saying that a space devoted to local artists and local bands would itself use local talent. Of course, they did. Local artist Nick Ferran designed the logo and branding. Local artists Dria Iris, Lissa Brown, and Nancy Fritz designed their bags. Leigha VandeZande screen printed the bags. Coffee comes from local roaster Yellow Cup. One thing is certain. Each time you visit Collective State, your experience will be different. That is by design. Jon purposefully changes the display continually. He wants us to look forward to a new experience each and every time we walk in the door. New merchandise, new artists, new art from existing artists, rearranged displays. Think of the places you go where after one or two trips you already know what will be on display on each shelf and what to expect on your next visit — Collective State is the opposite of that! 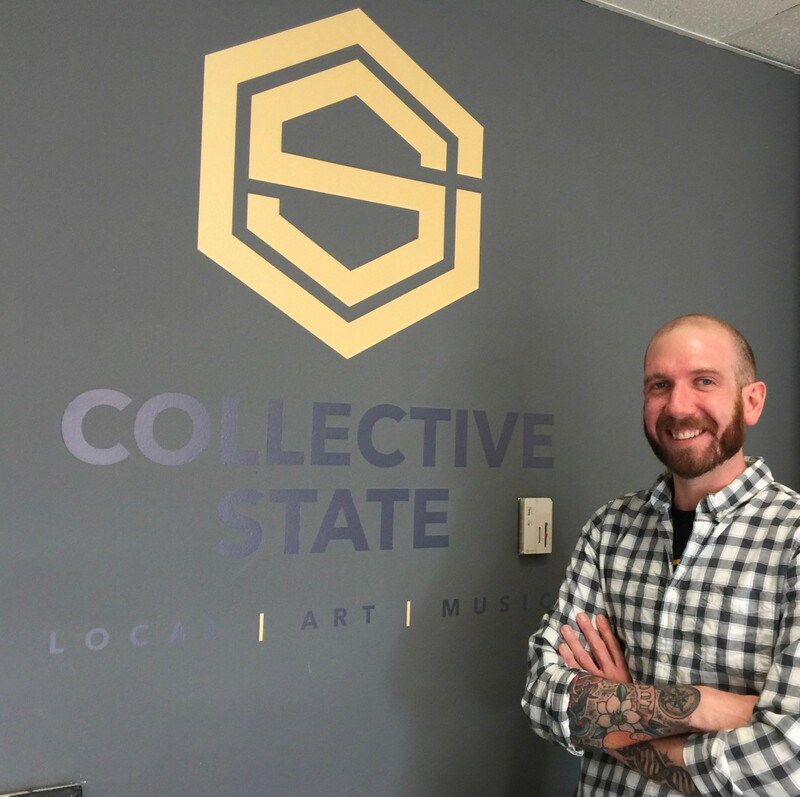 Ultimately, Jon’s goal is to move into a larger building — to enable Collective State to help more local artists to be self sustaining through their art — and encourage even more creatives to move here. I think Jon could go on forever citing local businesses and entrepreneurs that he admires. Here’s a start. Big Apple Pizza — for their welcoming and inviting community vibe in the Wells Street Corridor. Atrium — Start Fort Wayne’s entrepreneurial coworking space enables people to work without a massive investment for space. Conjure Coffee — a beautiful space and high quality coffee. And Corey has awesome intentions to improve the neighborhood (that community vibe). 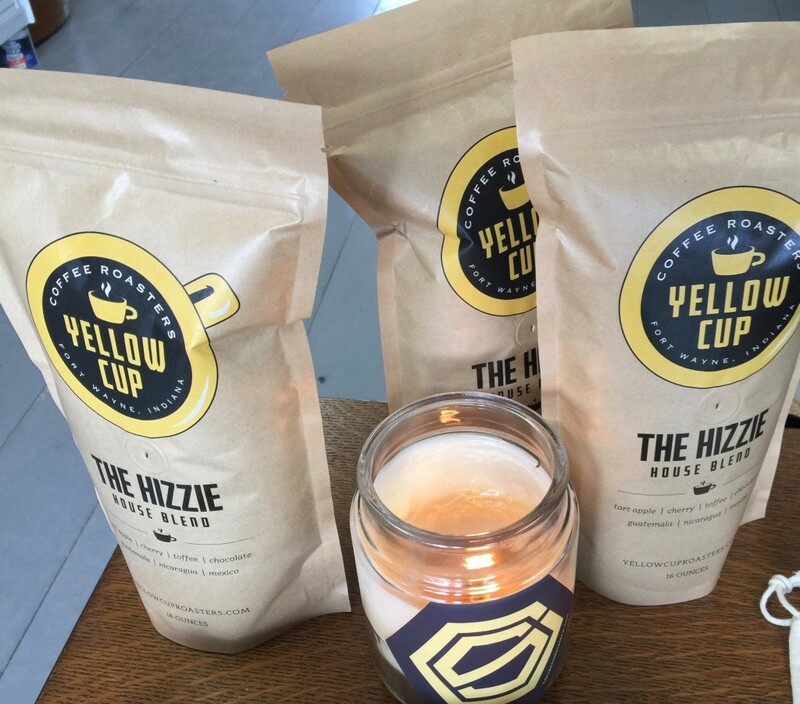 Yellow Cup Coffee — for an awesome product with the right vibe. Let’s Comedy — Ryan and Jared started with nothing and now produce multiple events at multiple venues with both local and national acts. 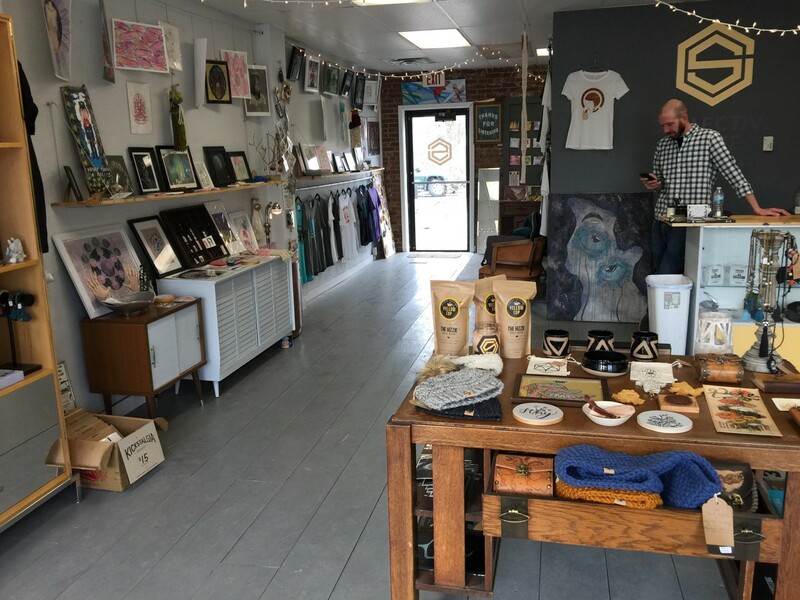 Tiny Clementine Art — Jon’s wife, Lissa, has grown her art business steadily over the past ten years while keeping true to her ecofeminist message. She has amassed nearly 19,000 Instagram followers! Be genuine in your interactions with people. Believe in your product, so you can be genuine. Know your people personally. Your customers, your vendors.